With the business model deployed, the verification process can begin to collect data and feedback to determine if the elements of mode are performing as expected. The hypothesis forming the basis for the Value Propositions can be verified with feedback from paying customers. This type of check can be conducted for other elements such as Key Partners, Channels, and Key Activities. All the interactions and interdependencies between elements of the business model can also be verified. Metrics should be identified to quantify the verification process for the elements of the business model. This tracking makes the task of improving the business model more concrete leverage real data based on customer feedback or market conditions. Tracking metrics enable a program of continuous innovation where the new business model is calibrated with minor adaptations to gain greater market traction. When a certain trajectory of profitability or customer adoption is observed, then the venture changes focus from verification to scalability. In sustainability innovation, metrics related to energy savings can be tracked to determine if the business model is making the desired impact. Leveraging the full capabilities of the operating model, the new venture can readily incorporate resources and services to begin the scaling process. A performance measurement architecture is needed to support verification and tracking of metrics associated with business model hypothesis. The architecture can leverage platform analytics present in the enterprise architecture while providing interfaces specialized for business model performance evaluation and monitoring. Who are the paying customers? Are they the customers we targeted in our business model design? The answers to these questions may lead to a change in the new venture’s offerings to those customers to identify an optimal market fit. At some point in customer development process, the metrics may indicate the need to adapt the business model, or pivot, in order to enhance the viability of the business model. The innovating team can revisit the design using the Business Model Canvas to produce an adapted version to reflect customer development analysis and findings. If the metrics are indicating satisfactory performance and analysis projects growth in market share, the new venture needs to consider scaling the components of the business model so that the venture can gradually be shifted into the operating core. In this scenario the outcome has been a successful business model innovation venture that is producing the desired impact on profitability or sustainability. The creative power of business model innovation can boost enterprises to new levels of growth and value generation. With an enterprise architecture that enables executive management to strategically and creatively advance business model innovation, the potential to unlock significant market value increases dramatically. Executives and intrapreneurs can collaborate to identify new markets, partners, resources, channels, and value propositions to deliver new experiences or solutions to customers. For instance, in 2003, Apple unleashed the tremendous disruptive potential of business model innovation when it introduced the iPod digital music player along with a novel distribution channel for the music industry and a convenient mechanism for consumers to legally discover and download music. Moreover, Apple introduced new mobile products, the iPhone and iPad, that added to network effects of the new business model. In three years, Apple’s business model innovation became worth almost $10 billion representing approximately 50% of the company’s total revenue. 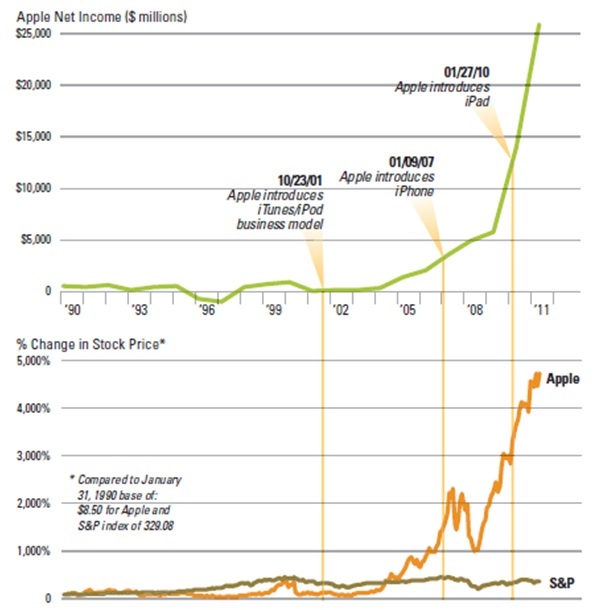 Apple’s market capitalization increased from around $1 billion in early 2003 to over $150 billion by late 2007. Clayton Christensen made the important observation that Apple was not the first company to bring a portable digital music player to market. Another company called Diamond Multimedia had introduced its player, the Rio, in 1998. So what did Apple do better? According to Christensen, Apple made the product its business model enabled by the technology.6 Business model innovation was the force that unlocked the value. Business outcomes driven by business model innovation are increasingly being recognized by executive management. A 2012 global survey by the Economic Intelligence Unit found that a majority of the 4,000 executives polled preferred business model innovation over other means to create competitive advantage.7 Reinforcing this finding is IBM’s 2012 Global CEO Report which determined that 33% of the more than 1,700 chief executive officers in 64 countries interviewed consider business model innovation as a key source of sustained economic value.8 In fact, the report found that outperformers were more bolder in their approach to business model innovation. With all the challenges CEOs face in the current environment, there is not a moment to lose for setting out to build an enterprise architecture that will harness the creative power of business model innovation to succeed in a global connected economy. Alexander Osterwalder (2004). The Business Model Ontology – A Proposition In A Design Science Approach. PhD thesis University of Lausanne. Business Model Generation, Alexander Osterwalder, Yves Pigneur, Wiley Press, 2010. Enterprise Architecture as Strategy: Creating a Foundation for Business Execution, J. Ross, P. Weill, D. Robertson, Harvard Business School Press, 2006. Reinventing Your Business Model, Clayton M. Christensen, Mark W. Johnson, Henning Kagermann, Harvard Business Review, December 2008. Creating Value Through Business Model Innovation, Raphael Amit, Christoph Zott, MIT Sloan Management Review, Spring 2012 Vol. 53 No. 3. 2012 IBM CEO Study, Leading Through Connections, IBM Corporation.